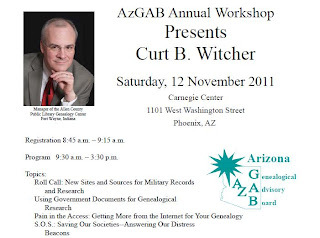 Arizona Genealogical Board (AzGAB) Annual Workshop and Board of Directors Meeting will be held at Carnegie Library, 1101 W. Washington, Phoenix. Anyone is encouraged to attend. Curt B. Witcher will be presenting 4 programs beginning at 8:45AM : Roll Call: New Sites & Sources for Military Records & Research; Using Government Documents for Genealogical Research; Pain in the Access: Getting More from the Internet for Using Your Genealogy; and S.O.S: Saving Our Societies – Answering Our Distress Beacons. Registration fee is $30 including lunch. Send check to Avis Calkins, 2118 N. Moappa Ave., Casa Grande, AZ 85122-1323. 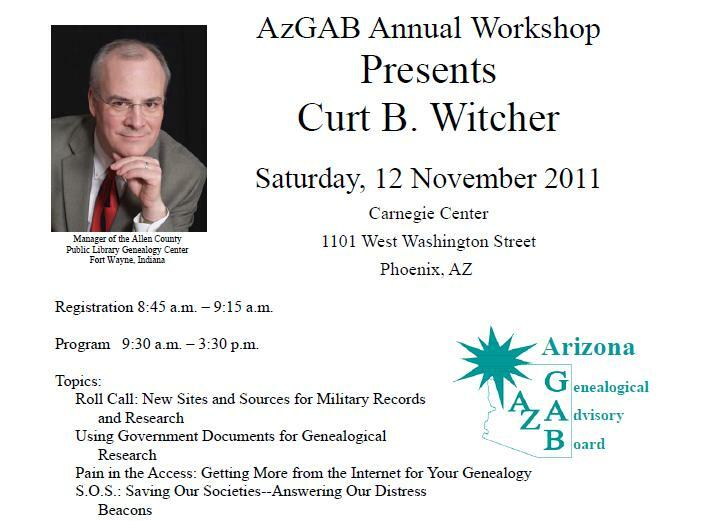 For additional information, contact Betsy Gottsponer at [email protected], or www.azgab.org. Bouse, Arizona Genealogical Society will be hosting Geoff Rasmussen for their annual Genealogy Technology Seminar at the Blue Water Casino, 11222 Resort Dr., Parker, AZ. 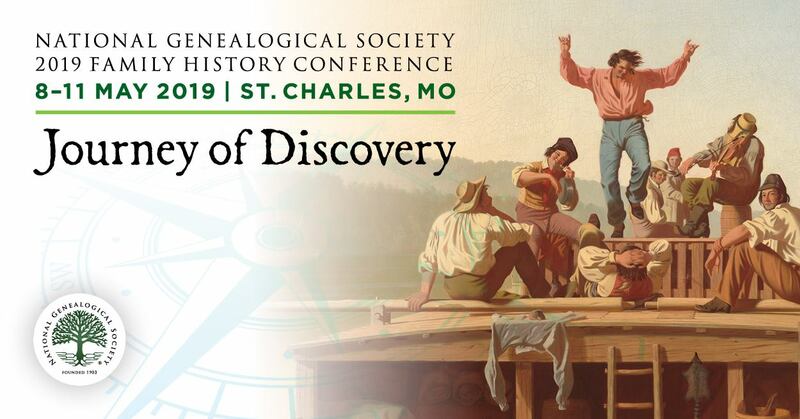 Topics include: 1) Improving Your Use of New Family Search, 2) Genealogist’s Guide to Working with Digital Images, 3) The Genealogist’s New Frontier: Blogging, Learn the basics of blogging, and 4) Sharing Genealogy Electronically: Publishing to CD/DVD, the Internet, and email. Registration is $35 for Bouse member; $40 for non-member before Dec. 1 or $5 additional at the door. Seminar begins at 9AM and ends at 4PM . For additional information, contact: [email protected]. 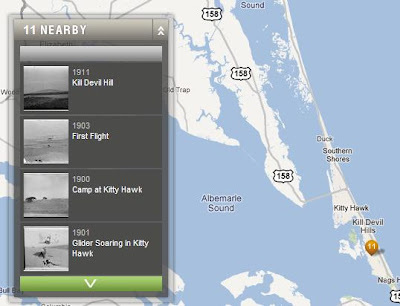 “The premise is simple: provide a platform where anyone can easily upload a photograph with two straightforward tags to provide context: Location and Year. If enough people upload enough photographs in enough places, together we will weave together a photographic history of the world (or at least any place covered by Google Maps). So wherever you are in the world, take a moment to upload a photograph and contribute to history! Visit the site -- you can explore the photos already posted or upload photos. 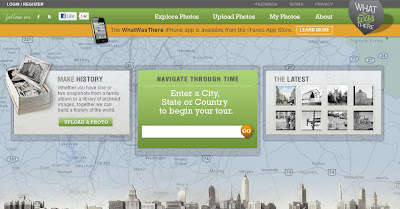 When you click to explore, you are take to Google map of the US with a number provided for each state indicating how many photos have been uploaded. 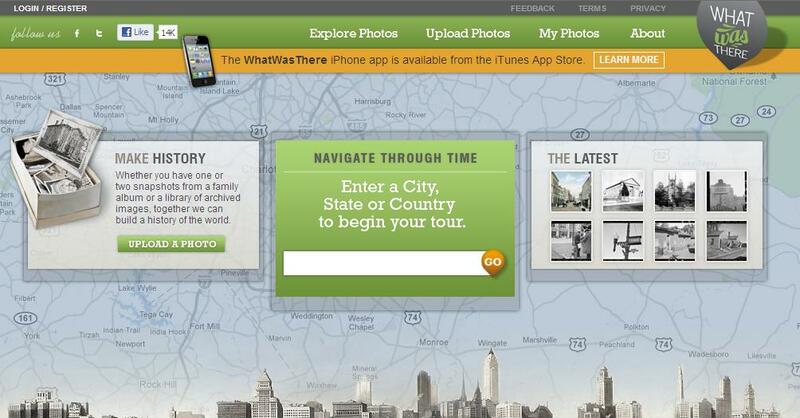 Click on any state and you will then be taken to a close-up map of the state and nearby with numbers indicating how many photos have been uploaded for which specific communities. For example, for Kill Devil Hills (NC), there are 11 photos uploaded and they are all from 1901-1911 and are connected to the Orville Brothers and their “First Flight” in the area. When you explore this site, if you find any really cool images of either just family, where they lived or which you just found interesting – please do share! NGS Members: 3 Days Only -- 48% Off RootsTech Registration -- Starts Today! Thanks to NGS's association with FGS, RootsTech is extending a very attractive discounted rate of $99 for three days only to any members of our society who would like to participate in this one-of-a-kind, dynamic conference in Salt Lake City, Utah. RootsTech is a leading edge conference designed to bring technologists together with genealogists, so they can learn from each other and find solutions to the challenges they face in family history research today. More than 3,000 people attended the inaugural conference in 2011 and their feedback on RootsTech was overwhelmingly positive. Don't miss out in 2012! Take advantage of the special $99 registration rate and we look forward to seeing you at RootsTech 2012! At RootsTech, genealogists and family historians of all skill levels will learn technology-based solutions to accelerate their research. From the Expo Hall and participant-driven unconferencing discussions to the RootsTech Playground, this conference is ground-breaking and unique. Check out rootstech.org for the most current information. Register at RootsTech.org between October 27-29, 2011 and use the promotion code FGS to receive the $99 rate. RootsTech is sponsored by Microsoft, Dell, FamilySearch, Oracle, the National Genealogical Society, brightsolid, Ancestry.com, the Federation of Genealogical Societies, the New England Historic Genealogical Society, Archives.com, Brigham Young University, and the Association of Professional Genealogists. JSTOR announced in September that it is making journal content in JSTOR published prior to 1923 in the United States and prior to 1870 elsewhere freely available to anyone, anywhere in the world. “This “Early Journal Content” includes discourse and scholarship in the arts and humanities, economics and politics, and in mathematics and other sciences. It includes nearly 500,000 articles from more than 200 journals. This represents 6% of the content on JSTOR. While JSTOR currently provides access to scholarly content to people through a growing network of more than 7,000 institutions in 153 countries, we also know there are independent scholars and other people that we are still not reaching in this way. Making the Early Journal Content freely available is a first step in a larger effort to provide more access options to the content on JSTOR for these individuals. In using this newly available collection, did you find some interesting tidbit which has helped your research or understanding of your ancestor’s lives? If so, please share! Suggestions for topics for future UpFront with NGS posts are always welcome. Please send any suggested topics to [email protected]icrpm.com. Susan Yockey, the National Genealogical Society Course Administrator, recently completed the NGS Home Study Course. Over several posts, Susan will share with us her perspective on taking the course – her joys and frustrations – her trials and tribulations – her successes and what she learned about her ancestors and herself along the way. We have already posted Part 1 and now Susan continues with Lesson 5 – Census Records through Lesson 8 – Probate Records. Lesson 5 of the Home Study Course covers census records. The people with subscriptions to Ancestry.com will find that this is one they can complete practically in their sleep. I don’t have Ancestry.com, so I went to the closest place that does; a branch of the Alexandria public library. As I mentioned earlier, I had done some pretty extensive research on some parts of my family so this was pretty easy. There were people on my chart, who I hadn’t done any research on them at all. I enjoyed tracking those people down when I could and there were a couple that I couldn’t locate. For those elusive ancestors, I tried to logically guess where they would’ve been living and that was challenging, but not impossible. Assignment 2 of this lesson asks the student to write a Census Search Report where you pick a census year and search a particular location for people with the same last name as one of your ancestors. I didn’t want to have to spend hours at the Alexandria public library, so I used HeritageQuest through the Arlington County Public Library’s website to search the 1920 Paducah, KY census for people with the same surname as my grandmother. To this day, I still have no idea if the people I found in that census are related to my grandmother’s family. Honestly when I started the course, I had visions that I would just breeze through the first CD without learning anything new. I was so wrong. As I’ve mentioned frequently, I’d done tons of research on my grandmother’s family. I thought that I’d found everything that was available, especially when it came to the research I had completed on my grandmother’s parents, my great grandparents. Her parents had been born just after the Civil War in Tennessee and according to the research I had done on their respective birthplaces, birth records weren’t available. I also couldn’t get a death record for my great grandmother who died in Kentucky because my research told me that the information just wasn’t available. Vital records are covered in the last lesson on CD 1. Reading the information on vital records in lesson 6 changed my whole perspective of the Home Study Course for me. The vital records checklist assignment encourages you to seek out vital records for your ancestors. Surprisingly, I found the death record for my great grandmother while completing assignment 1. I had no idea that the Commonwealth of Kentucky had kept death records for the time period and county where she died. Another piece of my genealogy puzzle was also found within lesson 6. The lesson mentions the Social Security system and the Social Security Death Benefits Index (SSDI). I went to the Social Security Administration’s website which gave me instructions on how to obtain my great grandfather’s Social Security card application (SS-5). The SS-5 is a copy of an original document and contains secondary information as to the ancestor’s date of birth, birthplace, and parents. However, this information is at least more current than the same information on a death certificate, which in my opinion is better than nothing. The first two assignments for lesson 6 are fairly straightforward; compile a vital records checklist for each ancestor on your pedigree chart and then order a birth or death record by mail for an ancestor. The checklist can be done on the computer by visiting the website provided in the assignment’s instructions. Ordering the birth/death record and waiting for its arrival can be time consuming, but that’s just the nature of the beast. The last assignment for lesson 6 requires the student once again to leave their comfort zone and venture out into the genealogical world to perform a survey of marriage records at a local repository. I visited my local courthouse in Arlington, VA to write my report on marriage records. I found that I had to go back to the courthouse twice to get the information necessary to complete this assignment. I didn’t find the staff in the circuit court’s office to be very helpful, but I did find it interesting to look through the old marriage register books at the information recorded there. What I liked most was learning how integrated Arlington County was in the far flung past, or as it was known before 1920, Alexandria County. I’ve read many genealogy books that talk about the importance of church records. I can see the value of them except when the family you’re researching doesn’t appear to be a very church going people. There are many people who don’t attend church or and they may have some apprehension when approaching lesson 7 which covers church and cemetery records. However, I feel that if those students read the assignment instructions carefully they will see that they can order a local church’s records on microfilm through the Family History Center system as a way to complete the church records assignment. I wound up ordering microfilm at my local Family History Center in Annandale, VA because the family I’m using didn’t appear to have attended church much. I ordered microfilmed records from a church local to Arlington County. When the microfilm roll arrived, I viewed the records and wrote a report about my findings. For the cemetery survey assignment, I chose a cemetery that was within biking distance from my apartment. I decided to have my husband come with me because the books I’ve read that talk about doing research in cemeteries say that you shouldn’t visit them alone. One Sunday afternoon, my husband and I biked to our local cemetery and made an unexpected discovery. It happened to be Mother’s Day and so everyone was out tending their family plots in the cemetery. I thought this was wonderful because I had read about people doing this in preparation for Memorial Day and my in-laws would always make an annual trip to put flowers on the graves of their various relatives’. It was great to see people actually raking up leaves and trimming bushes that were on the family’s plot. I don’t know if this happens everywhere, but it was a cheerful thing to see. We parked our bikes nearby at the columbarium and I looked around the area for a good plot to survey. I finally found one that wasn’t being groomed by anyone. It was a little tricky for me to figure out the boundaries of the plot at first. I’ve been to other cemeteries before where it seems that the plot boundaries are more clearly defined. While working on this particular assignment as I do with all of my Home Study Course assignments, I took out my printed copy of the assignments instructions so I could refer back to them frequently as I worked. I made my sketch of the plot I’d chosen and took many photos of the headstones and the area. The cemetery’s office was closed that day, but I resolved to visit it when it was open. I returned to the cemetery a few days later, when I knew the office would be open. I talked to the receptionist there and asked about their records. She kindly informed me that the records were only open to family members. I don’t have any relatives buried in the cemetery, so there wasn’t anyone I could get information on. Oh well, that happens when you’re doing genealogical research! It’s normal and to be expected that you will sometimes reach a brick wall. I returned home and was able to finish my cemetery survey report and I included in it the fact that the cemetery’s records were closed to me. To complete the assignments in lesson 8 I realized that I would need to make another visit to the Arlington County Courthouse. I have a full-time job, so I knew completing this lesson would be tricky to do with my 40 hour work week. By glancing ahead at Lesson 10, I could see yet another courthouse visit in my future. I decided to work on both lessons when I made my courthouse visit, so that I could limit the amount of time off I needed take away from my job. The assignments in this lesson cover probate and other court records. In order to comply with the first assignment’s instructions one must visit a local repository where probate records are kept. The second assignment is a probate file report where the student is required to examine the contents of a probate file so that you get the opportunity to see a variety of probate documents and learn about the genealogical information that they contain. There is an alternative of this assignment, where the probate file documents are supplied and the student is asked to write a report on those documents. Based on my previous experience at the Arlington County courthouse, I was happy to see the alternative assignment 2. Because I didn’t feel too confident that I would find a probate file that I could do a decent job on for the probate file report assignment. I visited the Arlington county courthouse for this lesson. There are indexes to the probate records kept in books that are in the same room where some of the land records are located. The paper probate packets are kept in the Probate office. Unfortunately, there isn’t sufficient space there for patrons to peruse the records at their leisure. In order to view a specific packet, one had to consult the index book that was in the room with the land records and then ask the probate clerk to pull the drawer where that particular packet was located. Some of the courthouses I’d visited had all of the old records kept in a room regardless of what category the records fall under. So the record keeping in Arlington County appears to be very constricting or at least orderly. I guess it depends on if you’re a glass half-empty or glass half-full person. The first packet that I looked at contained a will, which was in pieces. I couldn’t very well use that as a good example for my probate record repository report, but I did note down what information I could from it so as to include it in my report as the earliest record. I did find another packet that contained a will I could use for my report and because I wasn’t allowed to make copies of the packet contents myself, I asked the probate clerk to make a photocopy of it for me. For assignment 2, probate file report, I used the alternate assignment where the documents are provided to the student and you’re asked to write a report on the documents and include a citation of them as well. To complete this assignment I printed out the documents and then carefully transcribed them so that I would be able to analyze them more thoroughly. The assignment’s instructions ask that the report start with a citation of the for the probate file, so I began my report that way. I basically tried to follow the instructions pretty explicitly. The assignment’s instructions ask for more basic information about the documents, but I knew from experience with the course that it’s never a bad thing to really thoroughly discuss any documents pertaining to a lesson. I don’t think that you can go wrong with talking about genealogical records in depth for the Home Study Course. I think that I read through both my transcriptions of the probate file documents and my report on them several times before I was completely satisfied. Typically, I write up my lesson assignments and then basically sit on them for a day or so, because most of the time I think up something else to add to them at a later date. I don’t think that I’ve ever submitted an assignment in haste. I’ll be honest even after completing this lesson; I still don’t feel 100% on the subject of probate records. Since then; however, I feel that because I’ve dabbled a little more in probate records with my own personal genealogical research that I’ve gotten a bit better in my grasp of these records. What I learned in the Home Study Course about probate records has since solidified more, but I feel this is because it’s been combined with working the probate assignments and doing my own research on probate records that helped me to truly understand them. I think the reason is that I’m a person who learns more by actually doing the work than having someone tell me how to do something. I almost wish that an assignment in this lesson would be to locate a probate record for an ancestor and write a report on your findings; however, not everyone has ancestors who have surviving probate records. Possibly, if I’d visited a courthouse where probate records were more easily perused, I would’ve gotten more out of this assignment. Next up will be Lesson 9 …. Editor’s Note: Remember that you can learn more about the Home Study Course via the course syllabus or watch the video.